MAIN MANUFACTURING PRODUCTS, INC. has manufactured and distributed hydraulic flanges to SAE J518, ISO 6162, ISO 6164, JIS, and other flange standards for over 50 years. MAIN also manufactures and/or sells flange adapters, SAE split flanges, manifolds, sub plates, special hydraulic connectors and other components. 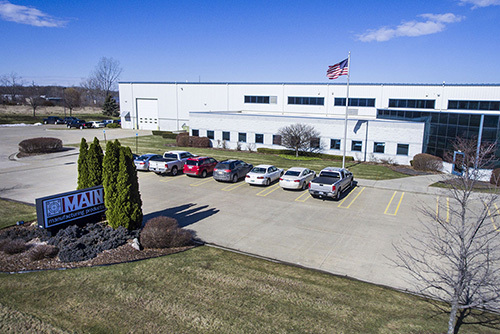 A twenty-first century manufacturing facility, located in Grand Blanc, Michigan, allows MAIN to control quality and helps assure on-time delivery of both standard and special parts. * A short movie about us can be viewed by clicking below. The following links will let you get to know us better. WE ARE HERE TO HELP. All orders and inquiries are reviewed by engineers. MAIN's weekly order review system discovers many customer typos, mismatched descriptions, mismatched parts, and other problems. This saves time, money, and embarrassment. MAIN's engineers sit on several SAE and NFPA committees, have been US experts to ISO committees, and are involved in writing the standards. These same people are available to help customers with a difficult connection or piping situation. *Note: Split flanges, cap screws, O-rings and some other accessory items are not made by MAIN Manufacturing. These items may or may not be imported.